Possibly the very best clone of Phal. 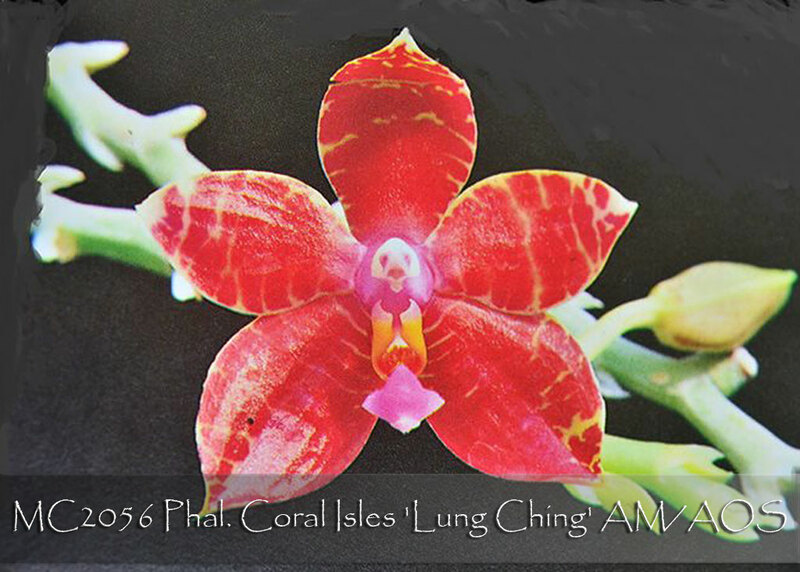 Coral Isles, ‘Lung Ching’ is an important novelty Phalaenopsis for breeding reds! It’s in the background of many amazingly successful hybrids like Phal. Palace Reef, Phal. Joy Fairy Tale, Phal. Lea Marie Salazar and Phal. Coral Nosa. A near primary hybrid, it’s the result of three important species for breeding novelty reds, Phal. amboinensis, violacea and lueddemanniana. Its fragrant heavy substance 6.0cm ivory flowers are heavily overlaid with dark magenta, leaving just a narrow ivory picotee around all its segments. Capable of amazing floriferousness for this type of breeding, when awarded this clone was bearing 20 flowers on three inflorescences. As an important classic that belongs in every collection and a great parent for future red hybridizing programs, ‘Lung Ching’ is Very Highly Recommended!